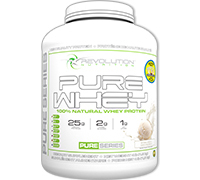 Individuals who want exceptional protein quality choose Revolution Nutrition™ Pure Whey. Only carefully selected sources of whey protein isolate, hydrolyzed protein and whey protein concentrate go into Pure Whey. Using only natural flavors and sweeteners, Pure Whey digests easily and is quickly absorbed after a workout to promote healthy recovery. Studies show whey is healthy and, over time, can reduce total cholesterol and increase HDL. Furthermore, studies have shown that whey protein can also lead to reductions in blood pressure, inflammation, and oxidative stress.2. 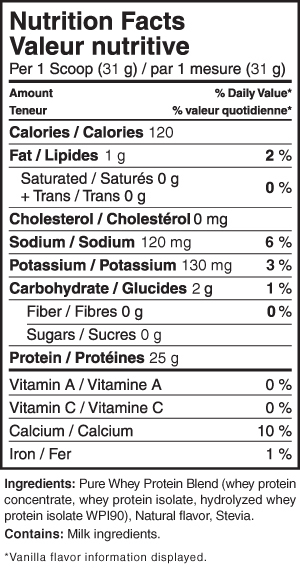 Whey protein is a better option than other sources of protein for inducing protein synthesis and aiding in fat loss. Studies have shown that due to whey's efficiency, Whey protein produced a greater insulin response, reduced appetite, indicating a potential for appetite suppression and weight loss in overweight individuals.3. Each serving of Pure Whey contains over 5 grams of naturally occurring Branched Chain Amino Acids which help the muscle recovery process and reduce muscle tissue damage during physical activity. Protein needs depend greatly on your body type, gender, weight and the level of activity you maintain. Mix 1 scoop of Pure Whey with 4-6 oz of water immediately before consumption.